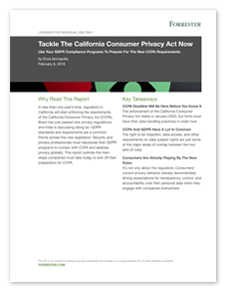 On Jan. 1, 2020, regulators in California will start enforcing the requirements of the California Consumer Privacy Act (CCPA). Security and privacy professionals must repurpose their General Data Protection Regulation (GDPR) programs to comply with CCPA and address privacy globally. This Forrester Research report outlines the main steps companies must take today to kick off their preparation for CCPA. Read the report to get a better understanding of where your organization stands in relation to the new regulations, and contact TITUS to learn how we can support you and all your compliance initiatives.